40-950 MHz., vertically polarized, and no adjustments required. 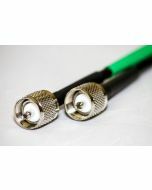 Ideal for scanning public service, aircraft, mobile and telephone frequencies. Reliable, high strength design incorporates solid aluminum rod, hardware and mounting assembly included. Mounts on vertical support to 1.25" O.D.